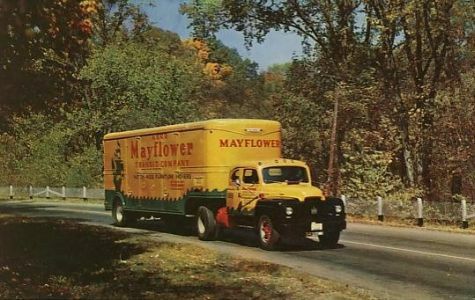 They were loading the Mayflower moving van as we pulled away as I recall. Our parents said we’d meet them again when we got to the new house in the new town and they unloaded all our stuff so we could live there. I didn’t quite get it, but I remember excitement. The old house was something of a puzzle to me because pain and unpleasantness always seemed to temper excitement. The tub of scalding water. The stay in the hospital. I remember the hospital but not the fall. I never liked the Smothers Brothers song very much. I love chocolate, but the accounts of my fall into the washtub haunt me still, and to imagine falling into a vat of anything is unnerving. I ponder now and then how one very small act has been lodged in my memory for sixty-three years without my actually remembering it. I used to have one of those baby books, and it had a clipping from the Worland, Wyoming, Daily News announcing I was in the hospital with all those burns. That Worland house was also where my mother grieved the death of her father, and we were left alone in the care of some nice people who sort of moved in while our parents went to Kansas City on the train for his funeral. I didn’t like having those strangers in the house, and Mother was somehow different when she came home. My first experience of grief, I am sure, but I had no way to understand it. Mother had a black and white photo of her father on her dresser, and I knew he was, but I don’t think I ever met him. But in that house we also had the excitement of learning we were going to have a baby brother or sister. In the new house so far away we experienced the joy—do five-year-olds experience joy or only fun—of our sister’s birth. There was also the eclipse of the moon, staying up very late to watch it. And the move to the second house in Kearney, and my first piano lessons. Finally. I had tagged along with Mother to her piano lessons back in Wyoming, and I couldn’t wait. Shuffling through fallen leaves walking to school for some reason by myself looking for the nickel I had lost in the leaves the day before, I sensed the passing of the seasons—a melancholy from within myself, loss, grief. A first-grader. A float from the homecoming parade of the State College passed by. Why do I remember that? Of moving day from Central Nebraska to Scottsbluff I remember nothing. But I knew the unfolding of myself to myself as a distinct person almost from the beginning. The fear that something could happen to me—not to us, but to me—going to the new school for the first time. The Longfellow school. The best part of school was the Friday morning all-school sing-along in the all-purpose room with the jolly little Kindergarten teacher who seemed perpetually to be winking at the piano. “Over hill, over dale, as we hit the dusty trail, and those caissons go rolling along.” This was, after all only five years out from the end of The War. “Oh, What a Beautiful Morning!” Oklahoma may still have been on Broadway. My parents gave up some small pleasure to pay for my expensive piano lessons with Mrs. Robinson—three dollars—who gave piano concerts playing Chopin from memory which my mother loved. Then Mr. Barta who I always thought was a bit strange. My two teachers played concerts together. Saint-Saëns. And then my first organ lesson when I was ten. Unlike the baby book, I know exactly where the Dickinson Organ Method is with the teacher’s mark for the lesson in August of 1955. These turning points are extraordinarily important for describing the mechanism of making the past usable in a life-long Self-authorship. At every turning point in one’s life, the Self emerges as the balancing of previous experiences and mental standards (1). It’s easy to reminisce about the scant memories from the first five years. 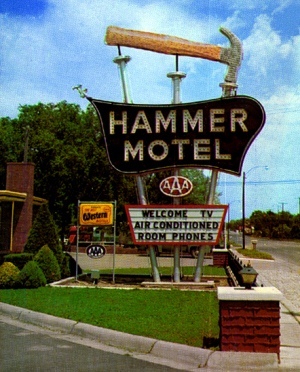 And the events of two years in a small Nebraska city that prided itself on being the midway point between Boston and San Francisco where the most memorable landmark (at least to me) was a motel with a giant hammer (made of what material I can’t imagine) on its sign next to old US 30 announcing Hammer’s Motel. I remember Mr. and Mrs. Jack Hammer well. I also remember sitting on Mr. Johnson’s lap—who had sat on Abraham Lincoln’s lap ninety years earlier. Two years are an interlude. But Scottsbluff. 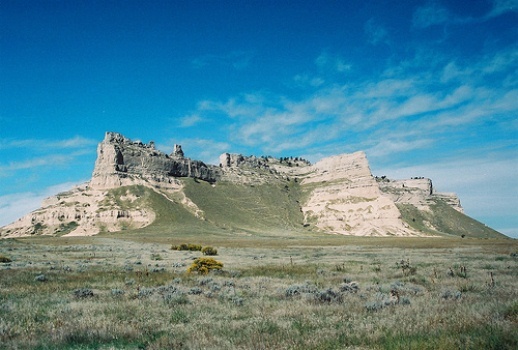 I became a Self in Scottsbluff, and the stories are complex, strange—the memories that haunt and signify—and impossible to tell. Humans behave both like a creator god who gives rise to the temporal order of the world they live in, and a trickster god who disrupts the order of that same world and then remakes it in the oddest manner (2). submerged in the external, in the day-to-day distractions, and often directed toward curiosity, the trivial, transitory excitement, and empty if not dangerous activities. Thus, the discovery of self and being are avoided, until such a time when we find ourselves in the grip of profound guilt, sorrow, anxiety, and the reality of death (3).
. . . one sees that contemplating the immediacy of one’s death, rather than engaging mortality only in the abstract, can systematically guide one from relative existential darkness to a place of self-awareness and growth (4). That’s my real lifetime of Self-authorship. (1) Aarelaid-Tart, Aili. “Avoiding Uncertainty by Making Past Usable.” TRAMES: A Journal of the Humanities & Social Sciences 14.4 (2010): 411-426. (3) Sadigh, Micah. “The Foundation of Existentialism in the Oldest Story Ever Told, The Epic of Gilgamesh.” Existential Analysis 21.1: (January 2010): 76. (4) Cozzolino, Philip J. “Death Contemplation, Growth, and Defense: Converging Evidence of Dual-Existential Systems?” Psychological Inquiry 17.4 (2006): 278-287.